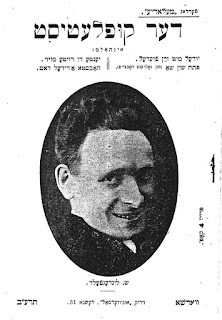 Polish Jewish Cabaret: Yudel mit zayn fiedel, sung by Shlomo Lindenfeld, was adapted from Fishel Zinger's version and predates Tuvim's "Stara piosenka"
Yudel mit zayn fiedel, sung by Shlomo Lindenfeld, was adapted from Fishel Zinger's version and predates Tuvim's "Stara piosenka"
I've started collecting information for a new project of Yiddish theater songs and popular songs from New York 1895-1925 and am posting what I find at Yiddish Penny Songs (information and recordings both). 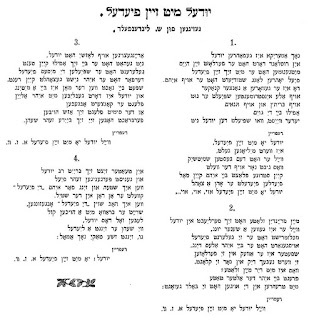 The song I'm discussing today, Yidl mit zayn fidl, straddles both projects: from the way the words of the chorus scan, it's clearly set to the same (or to a very similar) tune used by Polish Jewish composer Julian Tuvim when he wrote the Polish language song Stara piosenka (Old Song). 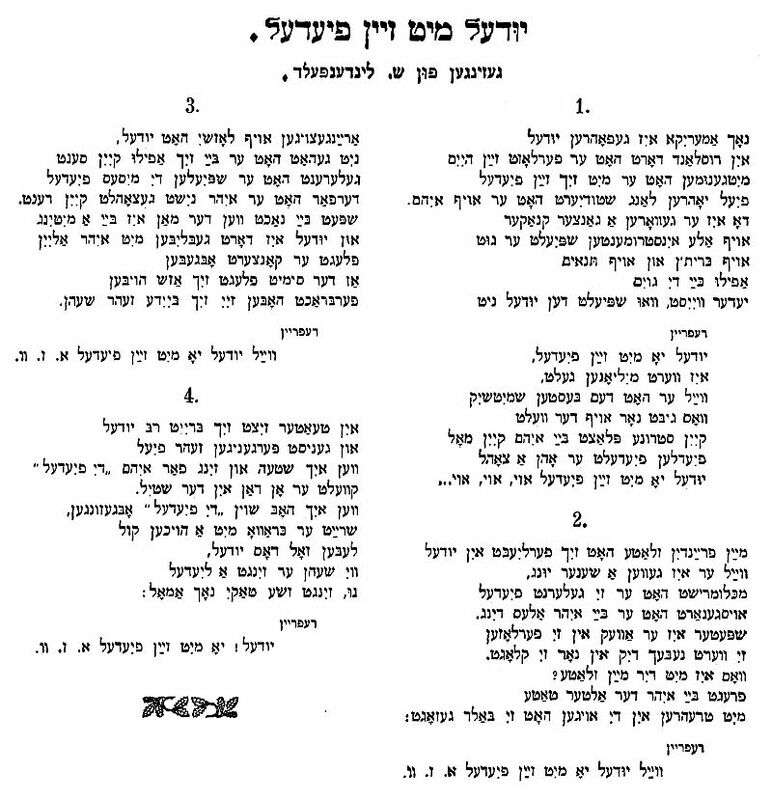 Also, the plot of Tuvim's version seems derived from the first verse of the Yiddish Yudl mit zayn fidel version published in Lindenfeld's booklet. ... and on the earlier broadside the attribution is "by F. Zinger." This person has been identified for me as Vaudeville and Yiddish theater personage Fishel Zinger (or Fishel Singer or Philip Singer). In Zilberzweig it is stated that he is indeed the writer of Yidl mit zayn fidl, "from an English text and motif." This mysterious Fishl Zinger is also credited as author of the song Tsum Tayvl. what i don't know is... who invent "him"? Irving Berlin or not? A commenter on the other blog post about this song identified F. Zinger as Fishel Zinger (aka Fishel Singer or Philip Singer). In Zilberzweig's Leksikon it is stated that Zinger did write Yidl mit zayn fidl and that it was sung in several languages AND that it stemmed originally from an English text and motif. the "problem" is very simple: Berlin wrote his "yiddle, on your fiddle play some ragtime" in 1909. and this song immediately became a great hit. but i haven't information about the date, when Singer's "yiddle" was born. so, i'm sure that "yiddle discussed" (in yiddish) is Singer song. but who create this "name" : yiddle mitn fiddle ? forgot to reuse next : "it stemmed originally from an English text and motif"
so... Zinger can't be "the man of creation" ? Dear anonymous: I have looked at Yiddle on your fiddle... and this is my conclusion: The only relation between the two songs is the Yidl/fidl rhyme, which was ubiquitous. I believe Zinger's song came out in 1909 also. Berlin's song has snatches of famous klezmer songs but does not have the distinctive melody shared by Zinger's song and the Tuwim "stara piosenka" and the earlier 'fidl dem altn lidl." "ubiquitous"? oy, vey! this is a "real point". you can name, please, at least one work in any language in which this rhyme (or name "yiddle with his fiddle") was used before Irving Berlin? It's been suggested to me that the yidl/fidl rhyme exists in Goldfaden's Sambatiyon but as I can't find a copy of it I can't confirm that. It's a problem that the early songsheets and 78s are not dated. And for Tuwim, my interest in his song now is that it shares the chorus melody with this 1909 song. I believe Fishel Zinger was quoting it too, but from where? > It's been suggested to me that the yidl/fidl rhyme exists in Goldfaden's Sambatiyon but as I can't find a copy of it I can't confirm that. maybe. why not? but, sorry, it does not matter, because this rhyme was not accepted among jews. please, take a look on "zen briders". original klezmers names was Arye, Tevye, Berl, even Shmerl, but as far as i know never (before 1909) Yidl. > And for Tuwim, my interest in his song now is that it shares the chorus melody with this 1909 song. > I believe Fishel Zinger was quoting it too, but from where? i never heard this record, but i'm sure that it was recorded in 1912 (catalog number 11149) and was reissued in 1927 (order number 5153). as far as i know in 1927 Syrena reissued full set of "such" Goldfaden's (?) operetta pre-war recordings. 11147 / 5153 "Kim Isrulik'l A Heim"
> I will try to find Sambation (Sambatien Sambatyon Sambatiyon) and see if there are clues. > Do you have to be anonymous? Who are you? Where are you? Ano-o-onymous—I never heard the Name before! Against Figaro Anonymous. What Profession? The page cited by Anonymous 9:36 says of Goldfaden's "Sambatiyon" - "Written before 1889. The actors Fishkind and Vaysman remember the piece. The text is missing." Thanks for finding this. The mystery remains. is Fishel (Philip) Kanapoff equal to Hyman (Heinrich) Kanapoff? I didn't think Lindenfeld was recording in 1910. It would be more likely that he recorded the song closer to the time he published the lyrics (ie around 1926). About the Kanapoffs, I don't know. They are both obscure. Thanks for caring!